"This 'paper pork' was inspired by a technique for smoking beef brisket that involves wrapping the meat in parchment paper after a certain point in the cooking process, in an effort to keep the meat moist and succulent. 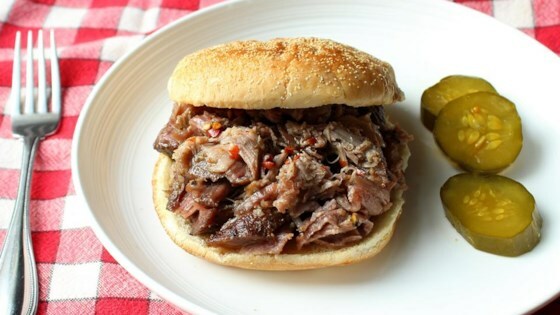 I decided to try it for an oven-roasted pork shoulder, wrapping it from the beginning, and it came out so perfectly tender and juicy, I've been doing it that way ever since." Mix salt, black pepper, paprika, brown sugar, onion powder, garlic powder, and cayenne pepper together in a bowl. Sprinkle rub mixture evenly and thoroughly on each surface of the pork roast, pressing it onto the surface. Cut a 4-foot piece of unbleached parchment. Place roast at one end and roll roast tightly in the parchment. Cut a second piece of parchment and roll the roast, positioning it in the opposite direction before rolling. Cut a long piece of heavy duty aluminum foil and tightly wrap the parchment-wrapped roast. Wrap the roast in a second piece of foil, and then a third, rotating the position of the roast each time. Place wrapped roast in a roasting pan with folded edges facing up to minimize leaking. Place in preheated oven and roast until tender, about 12 1/2 hours (or 1.75 hours per pound of pork). Remove pan from oven and allow the wrapped roast to rest at least 1 hour before unwrapping. Brush roast with accumulated juices in the parchment paper. This is the first new recipe I've followed without at least one tweak and I won't change a thing when I make it again. Excellent recipe. This is excellent, and so easy! Didn't change a thing. Very moist and fantastic flavor.